The play "Imoseyama Onna Teikin" was originally written for the puppet theater (Bunraku) and staged for the first time in the 1st lunar month of 1771 in Ôsaka at Takeda Shinmatsu's theater (ex-Takemotoza). It was quickly adapted for Kabuki and staged in Kyôto in the 3rd lunar month of 1771 at the Kitagawa no Shibai [casting]. It was a long run, produced from the 25th of March to the 10th of the 5th lunar month of 1771. For this premiere, the roles of Koganosuke, Hinadori, Uneme and Miyakoshi Genba were played by Sawamura Tanosuke I, Sawamura Kunitarô I, Nakamura Torashichi and Yamashita Shungorô. The "Komatsubara" scene went into oblivion at the beginning of the 20th century. It was fortunately revived at the National Theatre in April 1974, starring Nakamura Fukusuke VIII, Nakamura Matsue V, Ôtani Tomoemon VIII and Nakamura Kamon II in the roles of Koganosuke, Hinadori, Uneme and Miyakoshi Genba. "Komatsubara" is the second scene of the first act of "Imoseyama Onna Teikin". In a pine grove near the Kasuga Shrine in Nara a young government official named Koganosuke is taking a rest on a stool after a bird hunting with his blowpipe. A noble-looking girl named Hinadori arrives, accompanied by her maids Kogiku and Kikyô, and falls in love with Koganosuke at first sight. As she is too shy to speak her mind openly Kogiku borrows Koganosuke's blowpipe and makes her use it to whisper into Koganosuke's ear. They soon fall in love with each other. Their subsequent necking is detected by Miyakoshi Genba, a retainer of Emiji, a high government official trying to dethrone the Emperor. By Genba's remarks, the lovers learn that their families are enemies of each other so their love is ill-fated. Genba, who covets Hinadori, says that he will report Koganosuke's love affair to the government to have him punished for his improper conduct. Kogiku, wishing to appease him, offers the blowpipe to him and advises him to hear Hinadori's words of love through it. When he applies it to his ear, however, Kogiku blows an arrow into his ear. 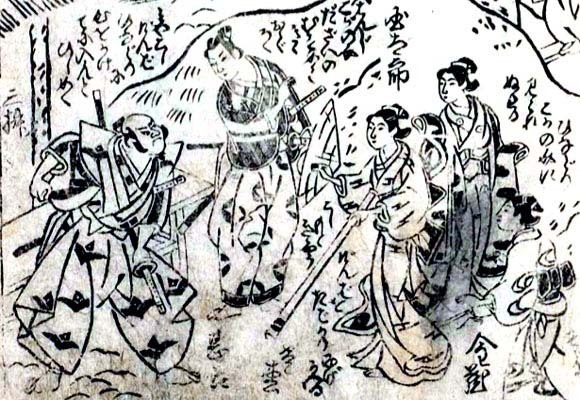 While Genba in consternation is taking out the arrow, Hinadori and her maids flee to her home. Presently a messenger comes from the Imperial Palace to inform Koganosuke that Uneme, Emperor Tenji's favorite lady-in-waiting and a daughter of Fujiwara Kamatari, a high government official, has run away from the palace. Hearing of this, Koganosuke, who is responsible for her protection, is flabbergasted. Genba hurriedly goes to the government office to report it to Emiji. Uneme then arrives and tells Koganosuke that Emiji, who is planning to marry his daughter Tachibana to the Emperor, has maneuvered to have Kamatari expelled from the government and that she is now searching for him. Koganosuke, instead of escorting her back to the Imperial Palace, disguises her with his hunting suit and goes away with her in search of her father.